Does dealing with your emotions or emotions of other people sometimes leave you weary or confused? Do you understand emotions and how to navigate them? And, the most important question: Can you make JOY the dominant emotion in your life? Those are some of the questions you will explore in Intentional Joy. And, you will find valuable tools to help you deal with each of those concerns. In addition to a brief intro to emotional intelligence and how you learn (yes, learn!) emotions, Intentional Joy offers many practical suggestions to help you live in joy and spread it to people around you. You will find insightful comments and enjoyable activities to guide you toward joy as your principle emotion. Understand emotional intelligence and joyful living. Assess your own emotional life and consider how to enhance it. Engage in practices that help you understand and master emotional well-being. Outline next steps to foster Intentional Joy now and in the future. Reflect on your progress every step of the way. 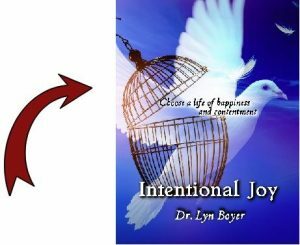 Intentional Joy is written for individuals wanting to experience a lifetime of more positive emotions. It is not offered for treatment of mental health issues. Whatever your reason for reading, Intentional Joy provides ideas and concrete steps for you to choose a life of happiness and well-being. Intensive workshops and personal coaching can cost you hundreds of dollars. You can download Intentional Joy: Choose a Life of Happiness and Contentment for ONLY $4.99 US. Please use the SECURE access below to purchase this valuable e-book.